Analogue to Digital - now what? Here's an example. A customer recently brought us ten old VHS tapes for conversion. She was shocked at the result - over twenty hours of rambling footage of family, holidays, birthdays and old TV shows. She knew they would never watch it all, so she came back and sat with us while we edited her content down into three one-hour shows that her family were delighted with. 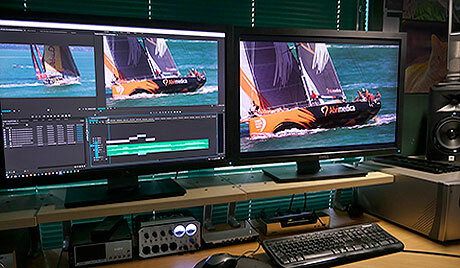 Video editing services - It's great if you have the know-how and the software to edit your own footage. If not, sit with us and let us help! With our editing services, you are in charge but we do the work. You'll end up with far better videos that your whole family will enjoy. Our capabilities - We have full video and sound editing facilities for analogue and digital footage up to and including HD, UHD and DCI 4K. We can combine video, sound, music, stills and effects from almost any source into videos that will play across all devices. Slide shows too - we routinely produce slide shows and presentations for our customers for weddings, birthdays and for business. Bring us your old photos, slides, video and your ideas. We'll give you coffee, expertise and a compelling show at very cost-effective rates. 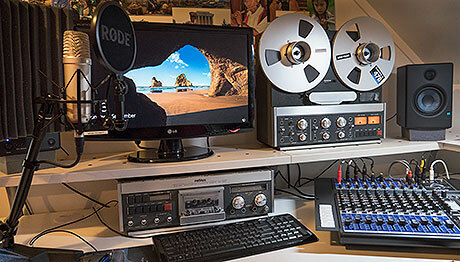 Analogue to Digital audio transfers - We don't profess to be a professional multi-track recording studio, but we are extremely well equipped for the services we provide - quality analogue to digital sound transcription services from vinyl, tape and audio cassettes at a cost-effective price point. Studio quality sound equipment - Our digital audio workstations run on Dell Precision with Adobe Audition and Pro Tools. Our studio-quality analogue tape decks have been totally rebuilt to manufacturer specifications and we use some of the best analogue to digital audio interfaces available, running at up to 24-bit/192 Khz. Given a good original, you'll be surprised at the sound quality we can achieve. Personal, expert service - We'll convert your old audio tapes and cassettes to DVD quality or better. We'll capture, process and clean up your precious vinyl records too . Our sound suite is a natural extension of the other services we provide. If you've taken the trouble to convert your old analogue originals to digital, let's help you present them as a polished product that you'll be truly happy with. Costs - We charge $100 + GST per hour for custom services. Call us on 0800 474748; we'd be happy to assist you with your project.